There aren’t many vehicles on the market these days whose sole purpose is pure, unadulterated fun, but the 2019 is one of them, especially in sun-loving convertible guise. 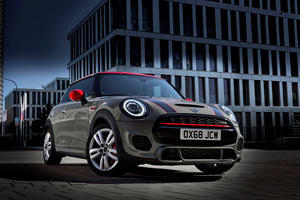 Driving a Mini is like taking a vacation from the monotony of dull, practical crossovers and cars. The question is, can you live with so little practicality in your vehicle? 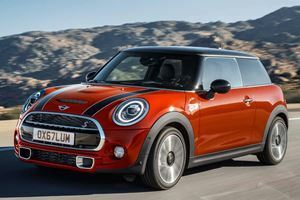 Although some purists bemoan not just the growth of the latest generation, but also the size of any new Mini compared to the original ‘60s icon, they must be some combination of munchkin and contortionist. I am usually pretty forgiving about confined cabins as I prefer a compact space to have everything within easy reach, but even as it is, the Mini offers the very minimum space feasible to accommodate average-size adults in the front, and the rear seats can barely squeeze in a child. Cargo space is a bit of a disaster, the roof mechanism blocking off much of the usable space and access to it is through a tiny slot from a drop-down tailgate. If you do have a short driver and front passenger, the rear seats are actually nicely bolstered buckets, not so good for car seats, but great for holding people in place while the driver inevitably slings the Cooper through the quick directional changes it was designed for. The front seats are even more deeply bolstered, but the sides aren’t stiff, so it’s not a problem getting in and out, although the armrest felt more in the way than a good place to rest your elbow. Although this model featured an automatic, that armrest is more nuisance than relief when rowing your own gears, and the cupholders are a bit awkward as well. The steering wheel is incredibly fat, so it’s easy to get a solid hold of it, and while some might find the steering too heavy, it’s refreshing after so many crossovers with super-light steering racks. Also refreshing and charming is the entire theme of the interior, with retro toggle switches, round gauges, chunky sections of soft-touch dash and gloss black trim, and a rectangular screen in a big circular housing. It’s all kinda terrible ergonomically, but it looks neat, and you do get used to it if you can get over the wasted center-stack real estate and awkward dial controller between the seats. The materials are a mixed bag, with some high-quality soft-touch plastics, but also some rough edges and leatherette that just creeps me out. The interior is right in character with the personality of the car, but its greatest trait is how it drives. It weighs just a smidge over 3,000 pounds, so it’s not much by modern standards (again, purists are laughing because it weighs more than twice as much as the original), and the similarly modern engine has more than enough punch to make it zippy. In the Cooper S trim, which is what we drove, the engine is a 2.0-liter turbo four-cylinder with direct injection and variable valve timing. Torque comes on early, 207 lb-ft of it available from 1,350 rpm, while the peak 189 horsepower arrives at 5,000 rpm with a throaty little rumble. 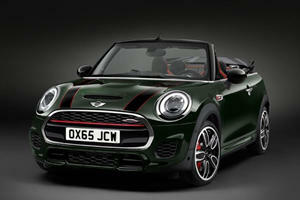 The Mini Convertible is strictly front-wheel drive, but with its small size, limited weight and just the right amount of power, it’s rarely a drawback, and it still manages a respectable 6.7-second sprint to 60 mph. With so little weight, moderate power and front-wheel drive, the Mini should be an efficiency standout, and the new engine tech helps, but it’s not quite as good as I was expecting. While you might hit the EPA’s estimated 33 mpg on the highway if you settle in on a nice cruise, you are unlikely to ever achieve 25 mpg city and 28 mpg combined if you have an ounce of fun in your body. It’s not the greatest sounding engine, but it loves to rev and is happy to stay wound up as you find gaps in traffic to dart in and out of. The transmission we sampled was a six-speed automatic, which did everything it needed to do, rarely drawing attention to itself when driven sedately, and popping off downshifts when a sharp stab of the throttle called for it. There aren’t many cars out that turn in as sharply or eagerly as the Mini, the front strut axle and multilink rear tuned to favor fun first and comfort second. That being said, the dampers do take some of the sting out of sharp bumps, but with a car this small and stiff, you feel pretty much everything with the standard setup, although available adaptive dampers might offer a bit more compliance. Because the Mini is exclusively front-wheel drive, it can get a bit squirmy coming out of corners if you really get too eager on the throttle, even with 17-inch tires fitted. In most situations, it’s just point and go, especially with the automatic transmission, which has a manual mode but not paddle shifters, so it was best left in Sport mode, which was aggressive enough without holding gears too long when just cruising. Although the Mini has lost some of its sharpness from generation to generation, the electric steering now more muted, its quick steering and lively chassis still fill you with joy when you find a place to slalom. Lane changes and on ramps were my favorite parts of the day with the Mini, the car responding sharply holding a line or changing directions like playful kitten. All that character packed into such a small package doesn’t come cheap. The most basic Mini Cooper 3-Door only starts at $21,900 (all models come with $850 Destination charge), and the Convertible starts at $26,900 with a plucky little three-cylinder turbo making 134 hp and 162 lb-ft. Although it’s not fast, it still has the same fun factor once you get going, and the Cooper S jumps to $31,400, with another $1500 for the automatic transmission, so most people will be looking at a minimum of $33,500, because the build tool insists that you must also include the $250 JCW steering wheel. Bear in mind that any color aside from gray and any little luxuries you might want to add to the basic equipment will run up the bill about as quickly as it can weave through a set of cones. Some of the highlights of base Classic models are 15-inch wheels, rear parking camera and sensors, leather-wrapped steering wheel, and leatherette seats. Optioned up like the Iconic trim we tested, it was $35,700, although it seems a better value with the automatic transmission, premium paint choices, interior customization options, real leather, upgraded sound system with satellite radio, Apple CarPlay, and the touchscreen navigation package all rolled into that price. You can certainly get a number of larger, more substantial convertibles like the Ford Mustang or Chevrolet Camaro in the ballpark, but those are quite a different proposition. Similar go-kart-inspired convertibles are hard to come by, the MX-5 strictly a two-seater, the Volkswagen Beetle more fun to look at than it is to drive, but the Fiat 500 Abarth is a hell-raising kart that still lists four seats and tops out around $30K. Compared to these options, the Mini Convertible starts to look like a fairly well-rounded, refined, and fun companion for sunny adventures. 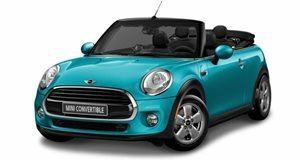 You can certainly pick apart the Mini Cooper S Convertible for any number of flaws, seeing it as overpriced for its size, underpowered for the price, or just plain impractical for normal sized people. You can, but if you do, what is wrong with you? Can you not bear the thought of someone having more fun than you? Maybe you just need a hug… The Mini is not a vehicle you choose by any logical process or pros and cons checklist. You have to sacrifice comfort for yourself and your passengers, give up on cargo space, get used to an entirely new interior layout, and it will definitely cost you more to buy and fuel than a Honda Fit or Hyundai Veloster. But from the cheerful surprised headlights to the Union Jack taillights, it’s bursting at the seams with fun: fun toggle switches, neat graphics in the infotainment, vibrant colors, and unmatched driving pleasure. It may not be as fast at the track as many more serious sport compacts, but few things are as fun in traffic and around the city. Throw in a convertible top for some sunny rays in summer or all year long in California and it’s a car that’ll keep you smiling whenever you drive it.